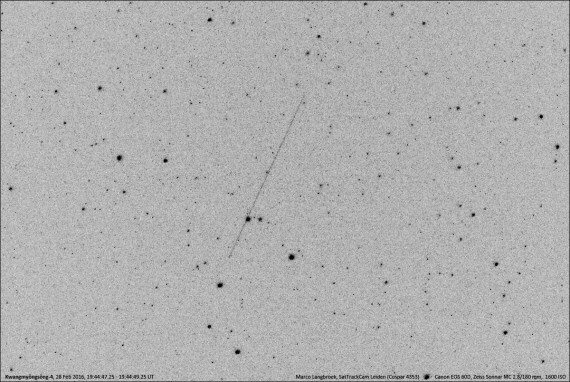 A satellite hunter in The Netherlands has captured the first known image of North Korea’s Kwangmyongsong 4 (???4?) satellite in orbit. Marco Langbroek took the image on Feb. 28 as the satellite passed through the nighttime sky. 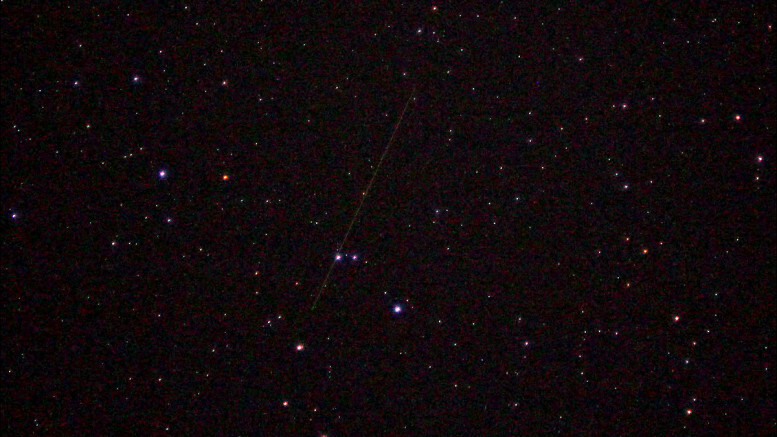 The photo was taken with a 2-second times exposure and the satellite appears as the diagonal line running across the center of the picture, above. What you’re seeing isn’t light from the satellite but the reflection of the sun from its solar panels. The satellite was estimated at apparent magnitude 7, which means it’s just too dark to be visible with the human eye. If you take a close look at the image above, or the negative below, you’ll notice the line appears to be fairly even. It had previously been reported to be tumbling, which would result in a reflection that appeared to pulse on and off, so it can be concluded that the satellite is either stable in orbit or tumbling very slowly. The following night, Langbroek managed another photo of Kwangmyongsong 4. This time it was over 17 seconds and the brightness didn’t change, further indicating it’s probably stable. The pulsing of a tumbling object was observed earlier on the evening of Feb. 28 by Langbroek when he photographed the second stage of the Unha-3 rocket booster. That’s tumbling through space and the difference in light levels can be see in this series of images. The current state of Kwangmyongsong 4 was also the subject of a blog post by Bob Christy on his Zarya website. Christy looked at orbital data to find apparent changes. He theorizes that the satellite’s solar panels were probably deployed on Feb. 13 and a stabilization system kicked in around Feb. 17. There are several types of satellite stabilization system, some triggered from the ground and some automatic, so it’s difficult to draw any conclusions on whether North Korean satellite engineers have any control over the satellite. While state media has declared the satellite to be in working order, it has yet to release any images photographed by Kwangmyongsong 4. Such images would be valuable propaganda, so their absence could indicate the satellite is not operational.